Have you noticed driving at night is more difficult than it used to be? Is the glare from headlights or the bright sun blocking your vision? Do you need additional light to read a book or the newspaper? Have you noticed that once vibrant colors are now dull? These are all signs that you may be developing or have cataracts. A cataract is the clouding of the normally clear lens in your eye. Though cataracts are painless, they blur your vision by restricting the amount of light that enters your eye. In addition to hazy vision, symptoms include unusual glare, poor night vision, and changes in the perception of color. Cataracts are the leading cause of vision loss in adults. They can occur at any age but are much more common after the age of 55. The good news is there are a wide variety of treatment options available that can not only remove the cataract, but can also improve your vision. Cataract surgery is the most common surgery in the United States, with more than two million procedures performed each year. John-Kenyon Cataract Center provides patients with experienced care coupled with the latest technology. Our doctors will evaluate your eyes and determine the best treatment options available for you. Many of our cataract patients are thrilled to learn about Lifestyle Lenses, which can improve your quality of vision and reduce the annoying vision issues that plague cataract patients. What’s even better is learning that cataract surgery is an outpatient procedure that allows you to rest comfortably at home following treatment. Because your vision is so important, we understand you may have questions about cataracts, the treatment options available to you, and our team of doctors. We hope you find the answers you are looking for here but if you have any additional questions about cataract surgery, do not hesitate to call us at 1.800.DIAL.EYE (1.800.342.5393). 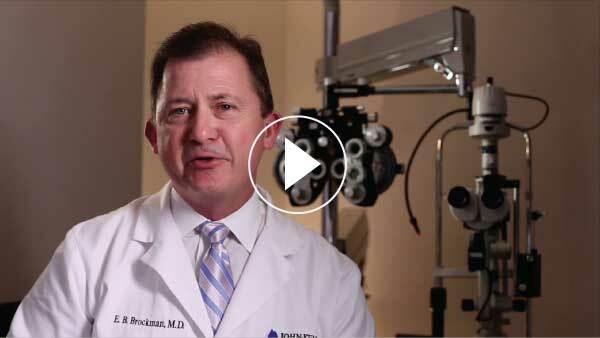 Dr. Brockman talks about the cataract evaluation process. If you’ve previously had another eye surgery, like LASIK, you may still be a good candidate for cataract surgery. Your doctor will take previous procedures into consideration when discussing treatment options with you at your comprehensive evaluation. Will I still need glasses after surgery? Jessica wanted to improve her vision and ensure her safety when driving at night! After LASIK, Jessica is seeing better than ever at 20/15! Stephanie’s dry eyes led her to take the plunge and get LASIK at John-Kenyon!